You are looking at a terrific table radio. Manufactured by Detrola Radio from Detroit, Michigan, these were very well engineered radios. 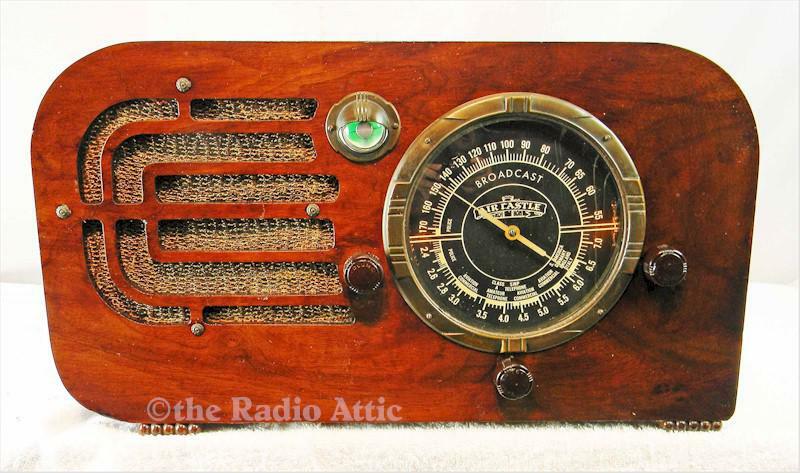 This radio was available under several names, but the Air Castle name was the house brand of Spiegel Catalogue Company. The six-tube super-het chassis plays well on both AM and Shortwave. Note the massively oversized dial with is brightly backlit. The new green tuning eye winks with great sensitivity as you dial station to station. The cabinet is a very fine refinish, with a fine factory like luster. The speaker cloth and knobs appear to be factory original. The fine American walnut is dramatic in its pattern. Les has done his usual and professional repairs and the radio plays in a fine fashion. Les has added a mini-jack to the circuit and you can choose your modern input device to the radio. Listen to your phone, pad or computer for the infinite amount of free content available. Bluetooth is available for an additional $25. 18"W x 10"H x 8"D.
You are visitor number 2,541 to this page.